Stretchy carseat/nursing cover free tutorial! You've all seen these awesome covers by now. They're amazing. And they're so easy and inexpensive to make! Follow these instructions and you'll be done in no time. You literally only have to sew 2 lines and you can make your own pattern with some copy paper. You need 1 yard of 60" wide jersey knit fabric OR 2 yards of two different 60" wide jersey knit fabrics if you like the combo look better (like my striped/floral cover). Doing it this way will make 2 covers. Don't forget to wash and iron your fabric before starting. You will mark 7" from the top left corner and then draw a curved line ending where the top papers meet at a 90 degree angle. Draw another curved line on the top right paper from its top left corner to its bottom right corner as shown. Pin the pattern to your fabric and cut out 2 pieces; a front and a back. Now put your two pieces together with the right sides facing each other pin them together. Use pins to mark 7 inches from the center on both sides of the top line. Sew the cover all the way up the sides, leaving a 14 inch space on the top. I leave the edges unfinished because they curl up and look just fine this way. Plus, I don't have a serger. Voila! You have a handy dandy cover with like a hundred uses! 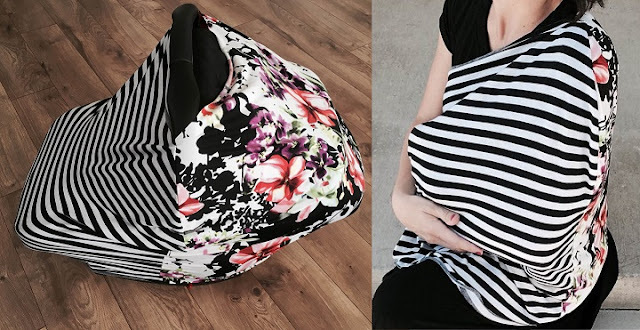 That floral/stripped one was a gift I made for a friend's brand new baby but the one below is one I made for my son who is now old enough to use it in highchairs and shopping carts. I hope you enjoy making this! I love it when I can make something that is both easy and inexpensive and SO USEFUL! Not to mention cuuuuuuuuute. Hope you love it too! 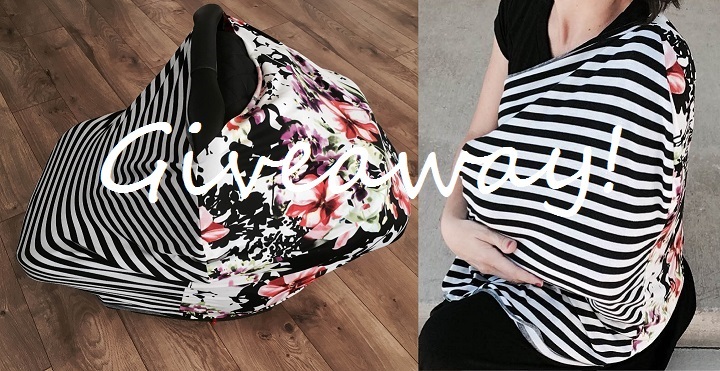 This giveaway is for a beautiful cover that can be used for nursing, for the car seat and more! All you have to do is click HERE and vote for the "I forgot my soccer ball" video (by clicking the little heart next to it)! Each vote YOU cast OR YOUR FAMILY MEMBER OR FRIEND casts because of you (only one of you is entered, not both) is considered an entry and you can vote using any device (such as tablets, phones and PCs). You have between now and Tuesday at 5:00pm MST to cast your votes. On Tuesday night please email me at aloadofcraft@hotmail.com letting me know how many times you voted and I will announce and contact the winner on Wednesday the 17th! Thank you for entering! Good luck! !